Page revised in February 2017. The photos were taken in March 2011. The Umayyad Caliphate started to decline a few years after the completion of the Great Mosque of Damascus and in 750 a new caliphate was established by the Abassids, the descendants of an uncle of Prophet Muhammad; they first established their residence in Harran, but in 762 they moved to Baghdad. 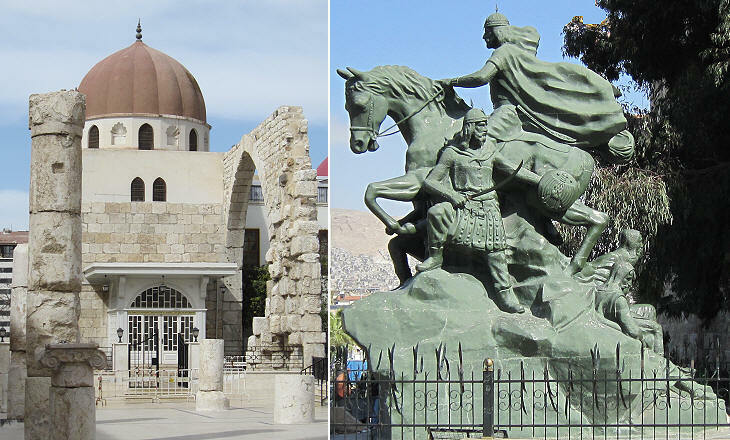 As a consequence Damascus lost its role as capital of the Muslim world. The Abassid Caliphate was unable to maintain the unity of the Muslim world; all the countries along the coast of northern Africa were conquered by the Fatimids, a dynasty of Algerian origin; the Seljuks, Turkish tribes from Central Asia gained control of Persia and threatened Baghdad; the Crusaders conquered the coastal strip of the eastern Mediterranean Sea. Damascus profited by the situation to gain autonomy from Baghdad, but, after a failed attack by the Crusaders, its inhabitants were forced to ask Nur ad-Din, the atabeg (governor) of Aleppo for protection; in 1154 Damascus became part of Nur ad-Din's possessions; his son Saladin conquered Jerusalem in 1187; he died in Damascus and he is regarded as the national hero of Syria. 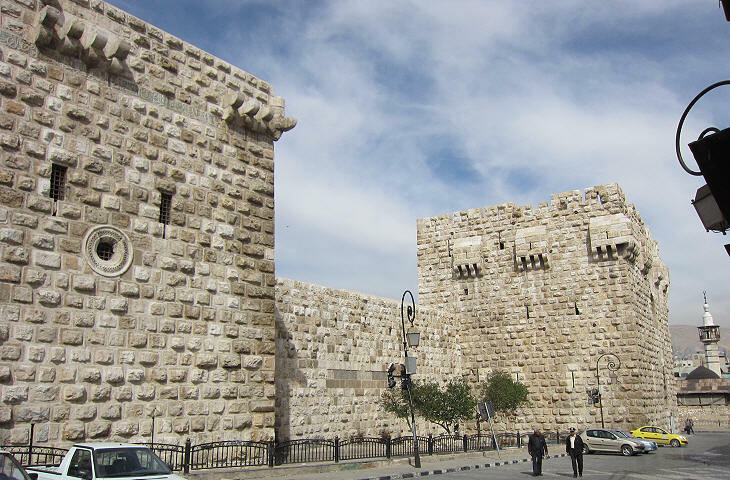 Saladin and his descendants (the Ayyubids) realized that the walls of Damascus did not provide an adequate defence and they built a citadel at their north-western corner, most likely on the site of a Roman fortified camp; unlike the Citadel of Aleppo that of Damascus was not located on a hill and it required the construction of a series of imposing towers, which were restored/modified by the Mamelukes, who replaced the Ayyubids in the control of Damascus in the XIIIth century. In 1260 a Mongol army supported by the King of Lesser Armenia invaded Syria and conquered Damascus; the Christian princes who entered the town celebrated a mass in the Great Mosque; it was however a short-lived success because in that same year Baibars, the Mameluke Sultan of Egypt, moved northwards with a large army, defeated the Mongols and their Christian allies and retook Damascus; in the following years Baibars dedicated all his efforts to eradicating the last Christian strongholds in the region, including Crak des Chevaliers, a formidable fortress north of Damascus. 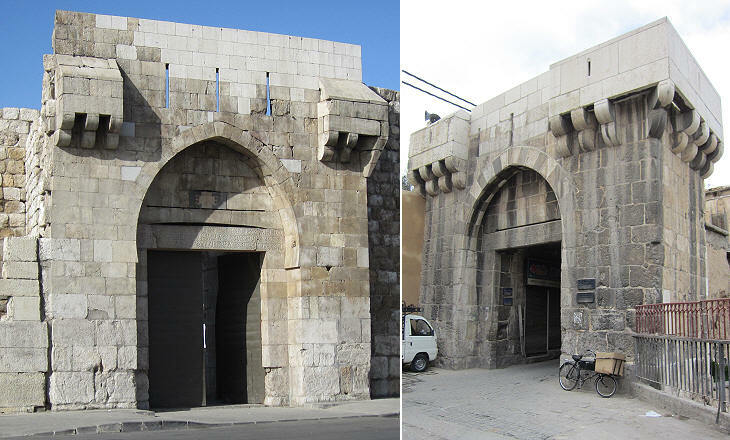 The Ayyubid and the Mamelukes built new gates which replaced some of the old Roman gates; one can still see the slits from which the archers shot their arrows; the new gates were not particularly designed to stand a major attack and were not protected by imposing towers; in addition, with the exception of Bab al-Salam, they were not opened at an angle of the walls or into a tower. 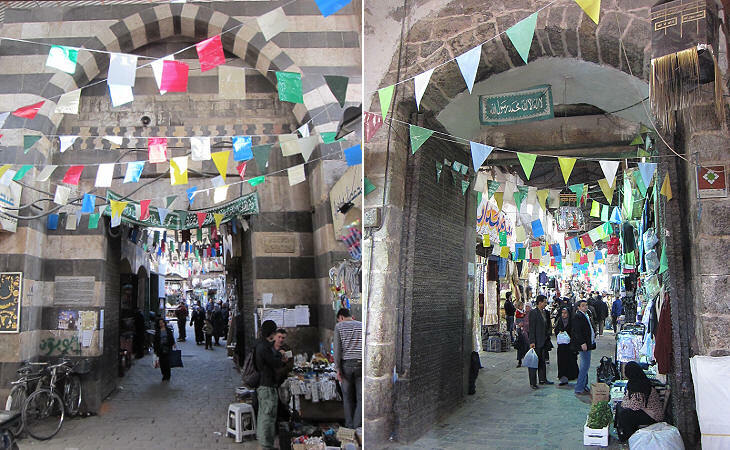 During the Ottoman rule the population of Damascus grew and new neighbourhoods were built outside the western and northern walls; the old town became more and more the site of an enormous market which expanded beyond the walls; today one has to pay attention in order to notice that he is crossing an old gate rather than a vault of one of the many souks which occupy all the western half of the old town. Bimaristan is a word of Persian origin which means the site of the sick; in the ancient world there were sanctuaries such as that of Kos where patients were cured, but apart from these locations the sick were isolated from the rest of the society. Contrary to the common belief of Islam as a religion promoting fatalism, Prophet Muhammad taught that "For every disease, Allah has given a cure"; this and other similar statements he made encouraged medical research and forced Muslim rulers to provide their subjects with facilities where their illnesses were treated; the Muslim world had advanced medical knowledge and hospitals were built in the very centre of towns. 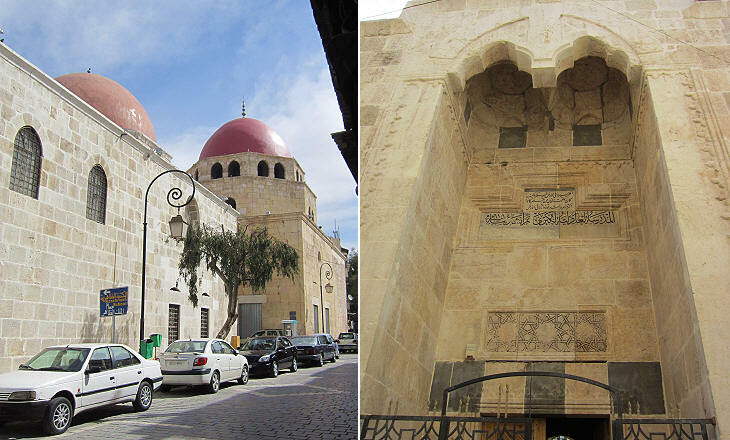 Soon after having entered Damascus, Nur ad-Din gave order to build a hospital, not far from the Great Mosque; today the building houses a small museum of the History of Medicine; its great portal shows the influence of Persian architecture. 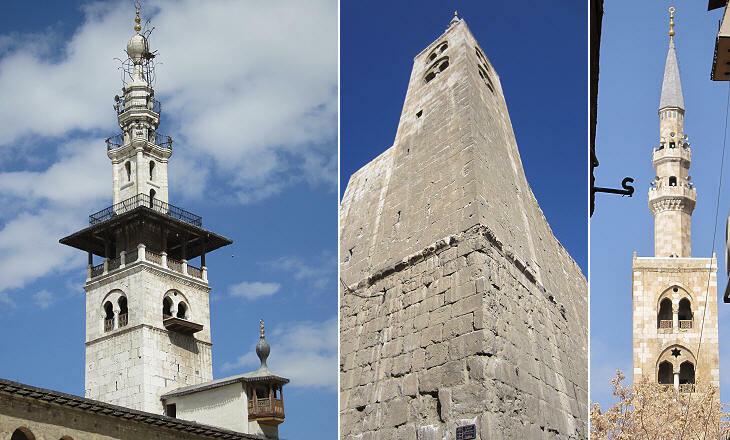 The Minaret of the Bride was the first minaret which was built; it is located at the northern entrance to the courtyard and it does not rest on a tower of the previous structure; it did not have a balcony so its appearance was very similar to that of a bell tower. The second minaret was built at the south-eastern corner; this minaret too has a square shape, which is typical of many minarets which can be seen in northern Syria/south-eastern Turkey (you may wish to see those at Harran and Silvan). 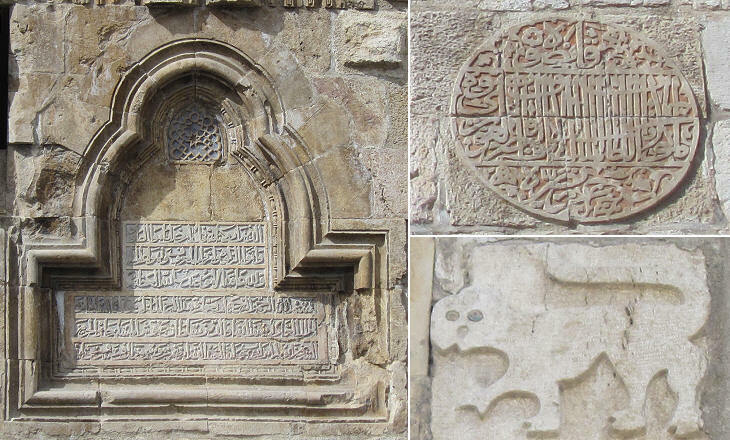 The third minaret was built on an ancient tower by Mameluke Sultan Qait Bey in 1488; from the inscriptions it appears that it replaced a previous minaret damaged by Timur in 1401. 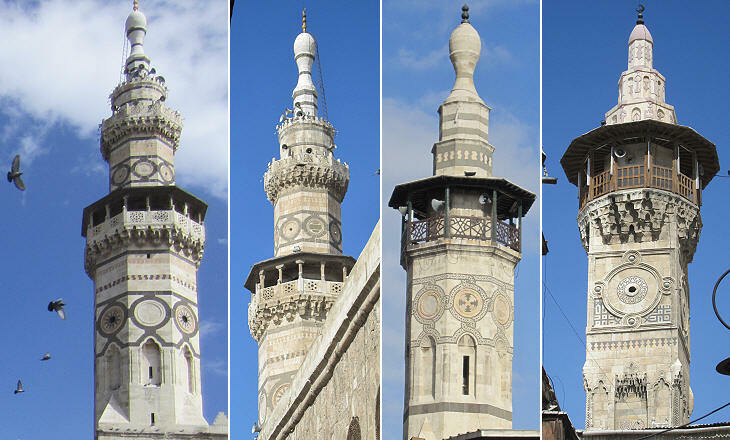 This minaret became a pattern for other minarets, including some Ottoman and modern ones. The construction of large medrese (Koranic schools) is typical of Persian art, but imposing medrese can be found from Sivas in the Anatolian tableland to Samarkand in Central Asia. 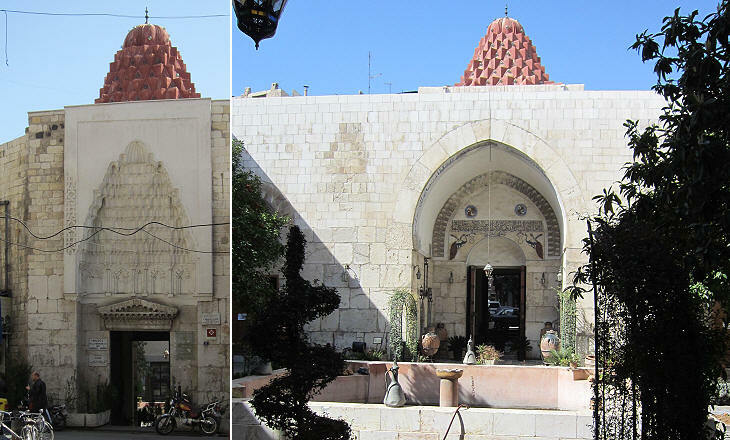 Two large medrese face each other near the Umayyad Mosque; they have large and finely decorated portals, but the street between the two is so narrow that they cannot be properly observed. Adiliyya Medrese was built by the Ayyubids in 1215, while Zahiriyya Medrese was built at the end of the same century by the Mamelukes also to house the mausoleum of Sultan Baibars. 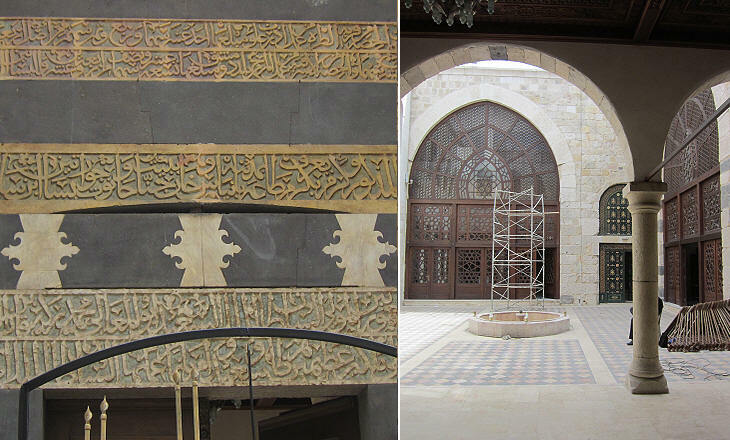 The portal of Adiliyya Medrese is as high as the façade and it has an unusual design. Very often later modifications or restorations have removed a construction device which was meant to increase the resistance of buildings in case of earthquakes; the horizontal cavity above the entrance to Zahiriyya Medrese had the purpose of allowing the structure to discharge the impact of seismic waves on a larger section of the wall beneath it; in origin a small keystone increased the effect of this device as it can be clearly seen at Mar Elias, an ancient church at Ezra, south of Damascus (see below).